Indian hair oils – Sesa vs. Bhringraj. Exceptionally unique composition, many favourable reviews, traditional recipes and original plant extracts – these are characteristic features of Indian oils used for hair care. Systematic application of traditional oils made from Middle Eastern plants can produce really eye-popping effects. 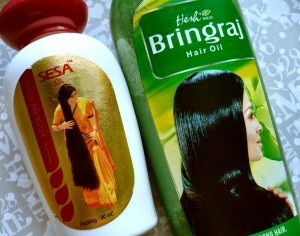 Today, we are going to compare two most common Indian oils that are typical for everyday hair care – Sesa and Bhringraj. Prices of both oils are almost the same. Unfortunately, it would be difficult for us to get the natural products in regular corner shops selling cosmetics. If we are really eager to give a go to these oils, we have to browse the Internet and find an online distributor of Indian goods. When it comes to the packages, in most cases Bhringraj oil is sold in a more functional bottle. The container is characterized with a small mouth which facilitates pouring out the oil. Sesa’s bottle in turn has bigger mouth which might result in getting too much of the cosmetic. Bhringraj oil has pleasant scent, characterized by citrusy and herbal fragrance. It is less intensive than Sesa’s fragrance. Sesa’s aroma is more deep, which might result in headaches. Both oils are solid in consistency, however, it gets liquid but only after warming up (in a water bath, left in a warm place or put into a microwave). Another similarity is the colour of the oils. Both products are green, however, Bhringraj is a little bit darker in shade. Because of the dispenser, Bhringraj oil can be perceived as more effective. Compositions of both oils are surprisingly similar to each other. Bhringraj is made from extract of Hindu plant bhringraj which is responsible for speeding up hair growth, hair strengthening brahmi extract, elasticising Indian amla oil, strongly moisturizing coconut oil, nourishing and slightly hair darkening henna, sandal wood of caring features as well as fenugreek that counteracts hair loss. Sesa includes only two oils of Indian plant origins: brahmi and bhringraj. On the other hand, this oil contains more nourishing oils like sesame, wheat, lemon and coconut oils. Bhringraj oil is said to be much safer vegetable oil, which does not cause skin irritation nor leads to hair loss as Sesa sometimes does (but rarely). Both oils are good at hair caring – they restore natural shine to hair, smooth it, facilitate combing and provides healthy look. Only Bhringraj oil has power of making hair longer. Many women confirm that after applying the oil, they notice baby hair growing out of their scalp. What is more, the problem of hair loss becomes eliminated. It is also worth pointing out that Seas does not have the feature of making hair darker in contrary to Bhringraj. Therapeutic hair oil Biotique, Bio Bhringraj. Are cosmetics with bhringraj oil better? Bhringraj as natural Lord of Hair from India. Bhringraj oil – Traditional Indian Hair Oil Copyright © 2019.